Grain Free Pecan Pie. You guys! I made you a grain free pecan pie! If I had to pick a favorite dessert, pie would be high up on the list. This time of year we think of apple pie, pecan pie and pumpkin pie. So I decided to come up with a healthier version of pecan pie. Grain free and vegan pecan pie to be exact. This pie is healthier because it is only sweetened with dates. If you like a super sweet and gooey pecan pie, you can add a bit of maple syrup to this. I thought it was plenty sweet the way it was. It’s also super easy to make! Just like my pumpkin pie, I used the crust recipe from Elena’s Pantry. I just love the simplicity of it. My pecan pie is slightly different than the classic recipe, but it’s very good! Looking for more pie recipes? 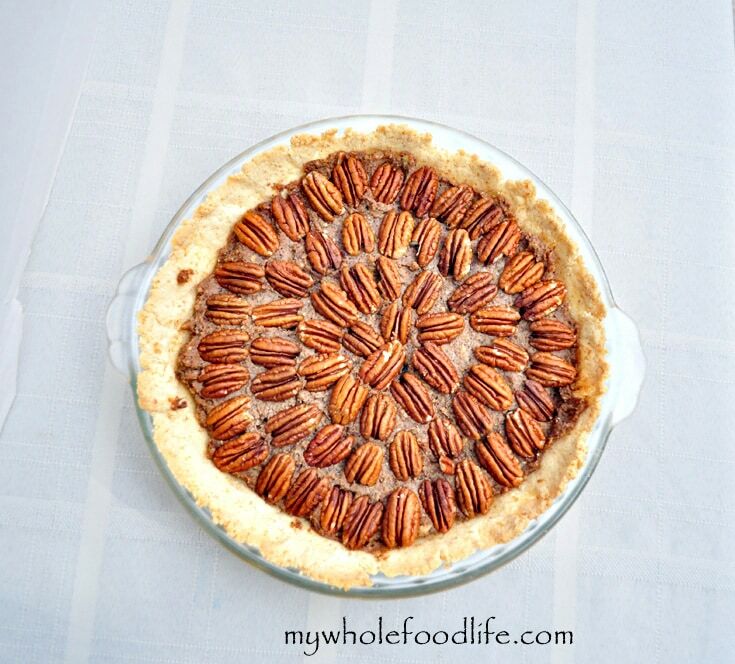 A delicious pecan pie with no added sugar! In a food processor combine the flour and salt. Then add in the egg and coconut oil. Once the dough forms, press it into a greased pie dish. I used a 9 inch pie plate . Bake at 350 for about 10-12 minutes. In a food processor , combine the pecans and spices, then add the dates, coconut oil and milk. Once everything is well combined, dump it into a pie shell. Top it with more pecans. Store in the fridge to set. About 30 minutes. This should last at least a week or maybe more in the fridge. Enjoy! Ok I think I just fell in love with you. Making this tonight! Awesome! I hope you enjoy it. Made it last night! SO GOOD. I can't thank you enough for this recipe. Since I went paleo, I found that indulging in my favorite dessert of corn syrup pecan pie left me feeling sick and shakey, so I stopped eating it altogether, and I really missed it. This pie is absolutely perfect, just what I wanted-delish, sweet, even nutritious...and I don't instantly fall into a sugar coma after eating!! Thank you also for putting up Elana's crust recipe (I don't think I've ever made such a simple easy crust!). This all came together beautifully. I am so glad you enjoyed it! I agree that Elana's crust recipe is the best! I use it in my vegan pumpkin pie too! Hi Ashley! Thank you! I'm sorry, I don't. I think you can plug the ingredients into My Fitness Pal to get a rough estimate. You are so welcome Puja! Glad you liked it! Can I substitute butter for the coconut oil in the crust and filling? Also, you don't bake the filling at all, right? I love that! You can sub another oil if you like. Hi Kelly. You might be able to mix it by hand. I made this on thanksgiving day and again tonight. Everyone liked it on Thanksgiving and none was left even though there were so many pies. Even my 20 yo dessert expert daughter who has started eating a lot of processed junk food says she likes it as much as "real" pecan pie. She said the filling reminds her of cookie butter from Trader Joe's. I used raw grass-fed milk and butter in the filling and I used butter in the crust. My daughter said we should make ice cream using this filling. I think I'll do that soon! Can't wait to try more of your recipes. Thank you! I'm so interested in this pie! I am puzzled as to why it "sets up". What is the texture? Does the cold coconut oil do it?! Thank you for all you do. The coconut oil and the caramelized dates set up. The texture is like a gooey caramel. "Should last a week maybe more in the fridge".....bahahahaha! I'm struggling to have it last an hour. OH MAN SO GOOD!!! This was good. Really good!!! Not overly sweet. but it wasn't like a traditional pecan pie where all you taste is corn syrup/sugar. I loved this and will definitely be making it again. Thank you!!!! You are so welcome Jamie! Glad you liked it. Awe, that's a bummer it wasn't like a traditional pecan pie.